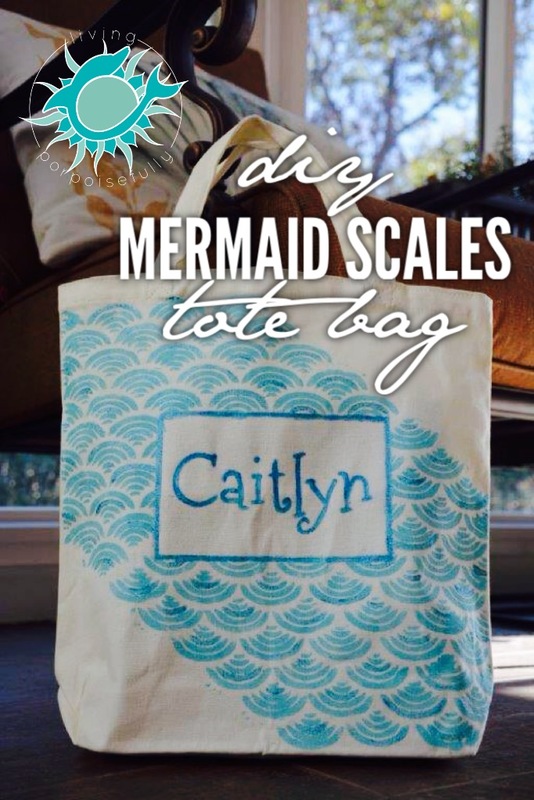 A mermaid or fish scale tote bag is the perfect accessory for beach trips, library trips, and just about anywhere. A tote bag for library books is a must-have for any kid, in our opinion! To fill it with new magic each trip to the library (and keep library books in a safe place between trips) is one of the most exciting things, no matter how old you are! Of course, a tote bag like this can be used not just for the library, but for going to the beach, around town, to school, or on a trip. So, as a gift for a special little girl, we set out to make a personalized ocean themed tote bag, with a mermaid scale inspired pattern. And this one’s not just for kids — it is a design that suits all ages of ocean lovers. So on to the adventure of making the mermaid or fish scale tote! Then we placed the paper where we wanted on the tote bag, and ironed over it. We had found a fish scarf in the same color scheme at the dollar store, and thought it might look cute tied to the handle. To complete the gift, we stuffed the tote bag with our children’s books and some other goodies like mermaid stickers, pencils, and a pencil pouch. Previous Post Big Announcement: Zale’s Tales Two is Here! So creative! Who doesn’t love mermaids? Lots of neat ideas all together. Haha- you’re so right, who doesn’t love mermaids! Thanks so much, glad you like the idea!